The concept fails to impress me, and so do most of the effects and the music. I find it all pretty ugly, except for the hires pictures by Zeitgeist. It's pretty ambitious, though, and I guess it's still a decent release. I hope Nightlord will keep coding demos, with some more interesting effects I'm sure he could make really nice demos. 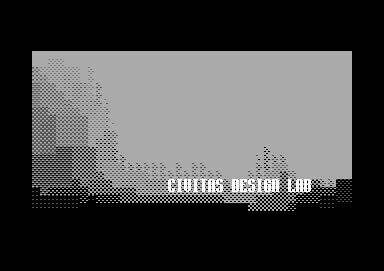 Best civitas demo so far imho. It seems that the year 2004 is the year of surprises for the c64 scene. Anyway, a negative point is the music. i have to agree that the musick is kinda annoying in some parts, but it perfectly fits to the whole story mood-wise. same for the pics. hope to see more like this from civitas in the future. Agrees with Dalezy. Music perfectly fits to the whole story mood-wise. Same for the pics. The presentation-flow is smooth and overal impression very good. I like it. zeitgeists gfx look good, and some of the parts have a great feel to them, but trying to piece together and rescue this incoherent mix of effects(some are neat, some are not) and graphics, with scene poetry just doesnt cut it. and no, civitas have done better before, but nightlord is showing that there is life after puterman in the group, and zeitgeist has found an equal to work together with. but next time, try to decide what leg to stand on, because i see alot of potential in this demo, both codewise and 'design'-wise. quote hollowman:but trying to piece together and rescue this incoherent mix of effects(some are neat, some are not) and graphics, with scene poetry just doesnt cut it. 2) it is wrong... the only part i coded before i decided on the concept was the landscape. i would like to think you didnot mean the second interpretation. No matter bigpixel (however voxel was kinda nice with the greys of C64 :) or small fx (however, moving lightsource vector with dither was really great! ), this is definitelly a rules. Interesting poetry, moody music (fits fine), nice impression, I watched it twice to get more of it.. Seems I'm the only one who loved the music? Very my taste. Anyhow, the mood touched me a bit, the lyrics less, but all in all, I loved the demo. Plus for the hi-res graphics! I must agree with most of the others who has posted here, a positive surprise but there’s still some work to be done. But the comments regarding conceptual design as marketing follows a way to familiar scene pattern. Just like a shark the scene will die if it doesn’t constantly move forward. Many brave attempts of conceptual design has been made during the last few years but all involved in the scene has a responsibility to challenge what we normally think is a demo and introduce new ideas and ways to think . Conceptual art can often be used as an excuse for laziness but used and implemented in the right way it clearly the way forward for a scene that’s on the edge of destruction by it’s techno fetish. Having said that, good demo. Look forward seeing the next one. nice demo for 64.. vectors is great.. music synchronization is congruous. Nice effects, nice music, nice mood... I knew Nightlord's previous music disc, but didn't know he is such a good coder. Congrats! --- By the way, I also liked the contrast between the rather gloomy mood and the little puns here and there. i love this one. truly wicked music. i like the running and door opening part, simple but nice things. Overall good gfx, good music and good code. So thumb up! Has its moments, but overall not my style. page created in 0.017254 seconds with 15 queries.